7.1 What is Stress in the Work Place? The intention of this wiki is to provide an online, self-directed learning tool, on the topic of vocational rehabilitation, for final year physiotherapy students and newly qualified physiotherapists. As this is such a wide topic, we have chosen to focus on the issue of stress-related work absence in vocational rehabilitation. There is a strong link between stress and sickness absence. Mental health conditions are increasingly prevalent and stress in the workplace is becoming more common. Work-related stress is estimated to be the biggest occupational health problem in the UK, after musculoskeletal conditions such as back pain. Since 1995 the number of days lost to stress has more than doubled. This work absence is a major concern for both organisations and individuals and requires urgency in addressing it. By the end of this online resource you will have gained knowledge that will enable you to define stress and explain its impact on both the individual and those around them. You will also gain awareness of the policies, guidelines and recent research related to vocational rehabilitation. With the aid of this resource, understanding of the physiotherapists role in a vocational rehabilitation setting and more specifically the useful strategies employed by them in the management of stress will occur. To help aid you, a number of tasks in the form of quizzes, reflections, case studies and learning activites have been developed after each section, in order to help you comprehend and consolidate the information read. Additionally, the resource provides you with an opportunity to further enhance your understanding of the topics found in the resource through further reading material. This image indicates that there is a learning activity. The material in this online resource has been developed in such a way that all styles of learning are accommodated. Diagrams and pictures for visual learners, videos for auditory learners and mind maps for kinaesthetic learners. If you don't know what learning style suits you best, click here to access the free online VARK Questionnaire.This tool will outline the best style of learning to suit your needs. The online resource will take approximately 10 hours in total to complete. During these 10 hours your time will be spent navigating through the information provided in the various sections, accessing the suggested links and completing the recommended tasks. To present a learning resource for Scottish final year physiotherapy students and newly qualified graduates which aims to develop their evidence-informed knowledge and understanding of vocational rehabilitation. To present a learning resource for Scottish final year physiotherapy students and newly qualified graduates which aims to develop evidence-informed knowledge and understanding of vocational rehabilitation for stress-related work absence and promote in-depth exploration of the physiotherapist’s role in this area. Explain the impact of stress and stress-related work absence on the individual. Critically evaluate the role of the physiotherapist in the management of stress-related sickness absence/work loss in stress and how this relates to vocational rehabilitation settings. Critically reflect on the challenges facing the physiotherapist in vocational rehabilitation. These aims and learning outcomes have been devised using Blooms Taxonomy in order to ensure this learning resource is within the Evaluation and Synthesis levels for our target audience of final year physiotherapy students and newly qualified Band 5 Physiotherapists. 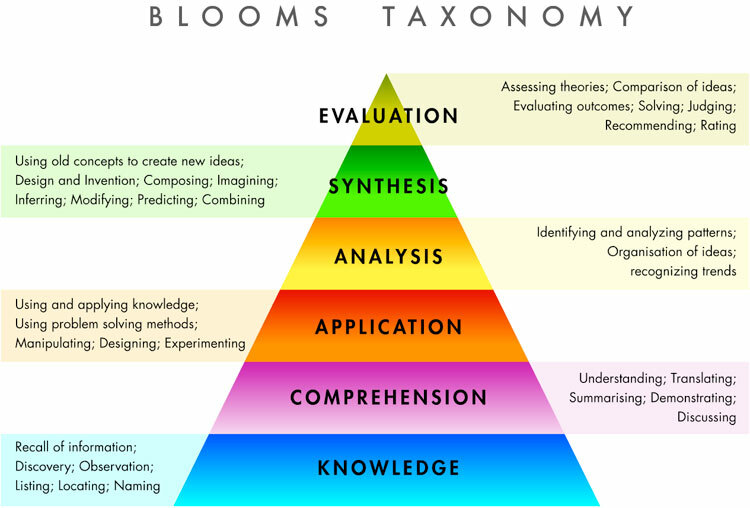 Blooms Taxonomy (Figure 1) aims to develop a higher level of thinking through a gradual pyramid approach of increasing difficulty. Construct a mind map of what you already know about vocational rehabilitation and what you already know about stress. There are numerous definitions of stress but no set established medical definition. However, according to the Health and Safety Executive stress is the negative response an individual exhibits when excessive pressure or demands are placed on them. Additionally, MIND define stress as a response to being put under pressure or situations that place an individual under pressure that if left unaddressed can result in psychological, physiological and behavioural changes to an individual. Stress can be divided into two categories: Distress and Eustress. Distress is the negative response to stressors whereas eustress is the positive response to stressors. When an individual is distressed they experience negative psychological states such as frustration, low satisfaction and alienation that eventually result in work and social loss as well as negatively effects on their physical and mental well-being. Conversely, not all stress is bad for you. For instance when an individual experiences eustress they have positive psychological states such as meaningfulness, motivation, enthusiasm and participation that result in positive implications for both the individual's well-being and performance. In additon to this, stress can also have a positive effect on individuals when experienced in short intervals. Short-term exposure to stress has been found to boost the immune system, however, it is still important to be aware that long-term or chronic stress has an adverse effect on the immune system that eventually results in illness. Therefore, the important feature linked to stress is its chronic effect over time. Stress can be caused through various things happening in your life. It can result by either external factors in the environment or internal factors to the individual. Stress can also result as a consequence of real or perceived psychosocial pressures. Being under pressure, having too much or too little control over something or even worrying can trigger stress. Stressors are things that cause stress. Chronic stressors encountered in everyday life include work overload, financial difficulties or family problems. There are many other things that can cause stress but the aforementioned stressors are the ones most commonly encountered in everyday life. 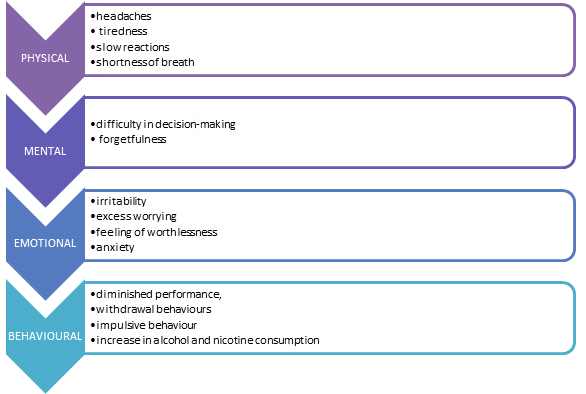 Although these stressors may occur independent from one another, most times they are interrelate. For instance, financial problems may have negative implications for both the individual and family. Additionally, research on the relationship between family problems and work have found that problems at home such as marital issues affect an individual's ability to perform adequately at work, conversely, pressure at work can affect an individual’s ability to function socially at home. Hence, even though a problem may be caused by work, family or finances, they may still have an overall impact in other areas of life and vice versa. Having said this, it has been reported by employees that the single most stressful factor in their lives above finances and relationships was work. 1) Click here to take The Stress Management Society's 'How Vulnerable to Stress are You?' test. 2) Using Rolfe's model of reflection, reflect on where stress is coming from in your life. What impact is it having on you and those around you? Are you coping with it? If so, how? If not, what's stopping you from coping with it? Among the leading contributors to disease and disability burden globally are mental health problems, making 10.5% of the worldwide disease burden. In the United Kingdom, mental health problems are the single largest source of disability, accounting for 23% of total disease burdens. About 1 in 4 British adults experiencing at least one mental disorder in any one year. Common mental health problems peak in middle age with 20-25% of people in the age group 45-54 years having a neurotic disorder. 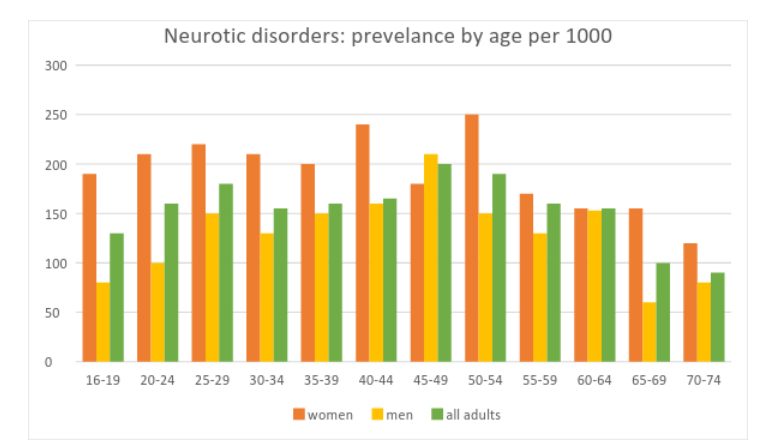 The figures fall as people grow older, with only 9.4% of people aged 70-74 years having a neurotic disorder compared with 16.4% of the general population (Figure 2). 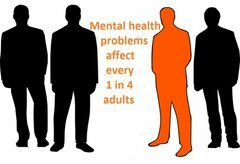 1 in 3 British adults in the working age population will experience some kind of mental health problem. Of this, 1 in 6 people in the working age population will experience depression, anxiety or problems related to stress. In 2013 the Labour Force Survey found that 73 million days were lost due to absence either as a result of sickness or injury. Mental health problems such as stress, anxiety and depression, musculoskeletal disorders and minor illnesses contributed to this number with 15 million, 31 million and 27 million, respectively. 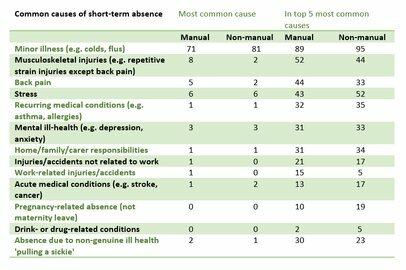 The main causes of short term absence (≤ 4 weeks) were minor illness, musculoskeletal disorders and stress. Musculoskeletal disorders are more prevalent in manual workers and stress is more prevalent in non-manual works (Figure 3). 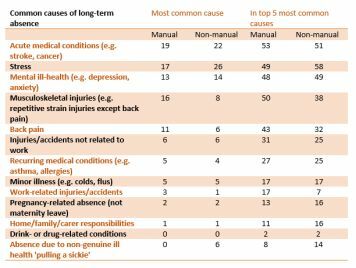 The main causes of long term absence (≥ 4 weeks) were acute medical conditions, stress, mental ill health and musculoskeletal disorders (Figure 4). The median annual absence cost per employee across all organisations was £554. This cost varied in the different individual organizations, ranging from between £400 - £914, with the highest costs being in the public services. The total number of cases of work-related stress, depression or anxiety was 487000 cases (39%) out of a total of 1241000 cases for all work-related illnesses. There was an estimated prevalence of 221000 male and 266000 female cases of work-related stress and an estimated incidence of 115000 male and 128000 female cases. The total number of working days lost due to work-related stress, depression or anxiety was 11.3 million, an average of 23 days per case of stress, depression or anxiety. The age group most affected is 45-54 years old. The prevalence of stress higher in non-manual workers than in manual workers. Please complete this quiz based on the Prevalence section. Click here to access the quiz. Although there is a collective opinion that mental health problems are caused by work, the relationship between the two is complex. While there is strong evidence that work is good for both mental and physical health, there is also evidence that mental well-being can be adversely affected by work. 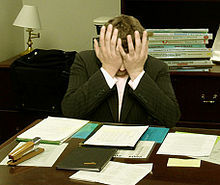 Work-related stress may occur when individuals are faced with work demands or pressures they cannot cope with or have very little control over. Job stress is one of the top 10 work-related health problems and has increasingly been associated with the occurrence of mental health problems, cardiovascular disease and musculoskeletal disorder. It is believed that the pathogenesis of physical disease is influenced by stress. Stress results in the production of adverse affective states which have a direct impact on the biological processes and behavioural patterns that predispose an individual to the risk of disease. Stress can elicit the same responses that the body would produce if it were in physical danger. The body goes into ‘flight or fight’ mode, triggering the stress hormones adrenaline, noradrenaline and cortisol which in turn cause accelerated breathing, increased heart rate and dilation of blood vessels leading to increased blood pressure. In small amounts these responses are not harmful however when exposed to them for prolonged periods degenerative changes can occur within the body. Prolonged exposure to increased heart rate, blood pressure and stress hormones consequently lead to hypertension, arrhythmias, myocardial infarctions, or stroke. Furthermore, adrenaline can cause muscles to automatically contract and tense up in a biological response to stress as a means to protect the body from further harm. Prolonged exposure to muscle tension and muscle overuse causes the muscles to fatigue, tighten or degenerate, consequently increasing the risks of developing musculoskeletal disorders. Stress can cause psychological changes that result in numerous adverse effects on an individual such as reduced competency, diminished initiative, loss of accountability and reduced concern for both work colleagues and the organisation as a whole. Additionally stress alters an individual’s physical state. The changes that occur in muscular structures can cause pain and discomfort resulting in an individual finding it difficult to sit at an office desk for the whole day or concentrate on work tasks due to lack of comfort. 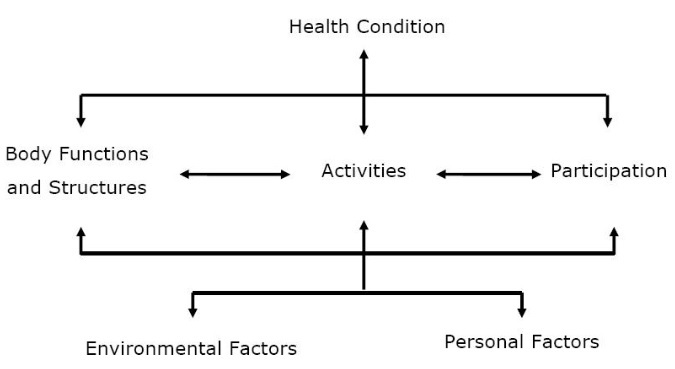 If stress is not managed immediately the physical and psychological effects of it that consequently lead to mental and physical changes can stop an individual from working at optimum capacity (Figure 5). The conservation of an individual’s physical and mental health depends on their ability to adequately satisfy the demands they are confronted with. The greater an individual’s ability and control are over the exposed demands, the more effective the response produced will be. Conversely, when an individual is exposed to demands found to predominate their current knowledge and abilities they exhibit reduced capacity to work and perform their job adequately causing them to produce responses that are not effective. 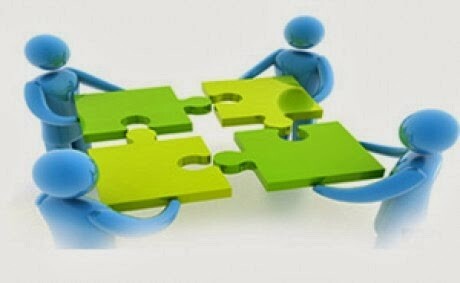 A major contributor to an organisation's profit and its existence is the amount of productivity delivered by employees. It is well established that excessive stress is detrimental to both an individual’s mental and physical well-being as well as productivity. With knowledge of this it can be recognised that stress is therefore a serious concern for organisations. Mental and physical changes can significantly influence an individual’s ability to work effectively which as a consequence can lead to increased absentee rates, increased turnover, sickness absence and work-related accidents. All of these negatively impact on an organisation by decreasing its probability of success in competitive markets through reductions in overall productivity and service quality, as well as increased expenditure on recruitment and selection costs as a result of turnover effects. Additionally, these factors cost the national economy an astounding amount of money annually through sickness absence which results in sick pay, staff turnover and loss of productivity. Furthermore, social welfare systems endure the costs of medical care and potential compensations in salary. The problem of stress is clearly serious and urgent action is required to address it. Although there is a common view that mental health problems and stress are caused by work, the relationship between the two is complex. While mental well-being can be affected adversely by work there is also strong evidence that work is good for both mental and physical health. Work has been found to provide individuals with social status, social support, participation, a way to positively occupy time and personal achievement. All of which are at risk of being reduced or removed once an individual is out of work. In addition to this, it has also been found that poorer physical and mental health have been linked to worklessness. From the evidence it can be concluded that work can be therapeutic in that it can transpose the negative health effects of being out of work. Hence, through work targeted interventions like vocational rehabilitation, which aims to restore functional capacity for work, and physiotherapy, which also aims to restore functional ability as well as enhance an individual's well-being, individuals with health problems are helped to return to work. Although there is little to no evidence on the effectiveness of vocational rehabilitation interventions for stress management there is a strong association between work and good mental health and it is through this link vocational rehabilitation for stress management can be established. 1) Define stress and work related stress. 2) We are aware that stress can result in musculoskeletal and cardiovascular problems. Name the physiological changes that occur to result in these problems. 3) What are the negative effects of stress on an individual's cognitive ability? 4) Why should stress be a serious concern for organizations? Reflection for impact: Knowing that stress has adverse effects on both physical and mental wellbeing it is important that it is addressed. Have you ever encountered a patient who was suffering from work related stress? Did you address this? What did you do? What do you think you could have done/done differently? The government policy ‘What Works, For Whom and When’ describes vocational rehabilitation as helping people with health problems stay at, return to and remain in work and this is unanimously the widespread definition. The Vocational Rehabilitation Association describes vocational rehab as any process which supports people with functional, physical, psychological, developmental, cognitive or emotional impairments to overcome obstacles to accessing, maintaining, or returning to work or another useful occupation. Vocational rehabilitation can be described as an idea or an approach, as much as it can an intervention. An effective vocational rehabilitation service should adopt a multidisciplinary approach, involving both healthcare professionals and employers. Vocational rehabilitation can also be practiced in a variety of settings, where effective communication between everyone involved should be at the forefront of practice. Primary healthcare settings can have a positive effect on occupational outcomes, either helping people with mild to moderate conditions return to work promptly or continue to offer treatment, education and help devise a return to work plan for a person who requires further assistance. Workplace interventions can also be highly beneficial. Many organisations have developed sickness absence and disability management programmes which efficiently cuts costs and enables return to work or the possibility of adapted working. More structured vocational rehabilitation programmes can also be followed for those with more severe cases. Vocational rehabilitation programmes can help to improve work outcomes for those in the early stages of claiming incapacity benefits. Incapacity benefit comes after a period of statutory sick pay and generally does not start until week 29 of sickness absence. However, many people are not employed at the time they start receiving benefits and they can often be faced with many barriers when trying to return to work. A person is likely to remain on benefits long term once they have been claiming for 1-2 years, meaning it is vital for vocational rehabilitation to play a part early on. For many people these days, work is their key determinant of self worth, family income and esteem, as well as identity within the community and social fulfilment. Carol Black’s ‘Working for a healthier tomorrow’ review looking at the health of our working population suggests that the average UK employee is absent from work due to sickness for six days each year. Although these figures vary between workplaces, it is thought that these absences equate to an annual cost of around £598 per employer. Therefore, the estimated cost to the UK economy as a result of employee absence is around £100 billion annually- which is greater than the NHS annual budget. Healthcare understandably plays a vital role in Vocational rehabilitation, but ultimately, it is not effective without working closely alongside employers. There is strong supporting evidence that a proactive workplace approach to sickness and modified working is not only most effective but is also an effective cost saving method for the company, especially in larger enterprises. Employers can have a key role in facilitating an employee’s early return to work following a sickness absence by having early, regular and sensitive contact during their leave, although around 40% or organisations have no sick leave management policy at all. This report also discusses the stigmas associated with absence from work due to disability and ill health, and states how this can also be a contributing factor in delaying a person's return to work. This is especially apparent in employees suffering from mental health conditions as organisations often fail to recognise their capabilities. There is significant evidence to suggest that the longer a person is absent from work due to ill health, the harder it is for them to make an effective return. A graded return to work plan can often be adopted by effective negotiation and communication between employers, employees and healthcare professionals. The graded return to work may aim to increase the hours and days worked whilst increasing the complexity of tasks and expectations in the workplace until the employee can safely continue with their previous duties over a period of time. Although employment rates for those suffering from a disability or long term health condition are increasing, with employment rates in Britain being high when compared to most countries, 7% of the working population are still seeking incapacity benefits, while another 3% are off work sick at one given time. Below is an NHS video on vocational rehabilitation. There are a number of policies and guidelines in relation to Vocational Rehab that provide a summary of key information which can be used to supplement your clinical practice. Numerous documents have been established by The Scottish Government and the Department for Work and Pensions in order to support the importance and implementation of Vocational Rehabilitation. 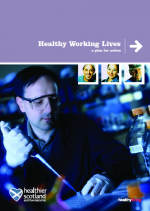 The following questions are based on the Healthy Working Lives: a Plan for Action document. You can access this document by clicking the picture below. What services are currently available in Scotland? Are you aware of any that are not mentioned in the document? How do you feel these services affect you as a physiotherapist? Critically reflect on an experience you have had where knowledge of these policies may have changed your approach to your patient/treatment. This activity is based on the Building Capacity for Work: A UK framework for Vocational Rehabilitation document. Click the image below to access it. From your reading so far, what is your understanding of what vocational rehabilitation involves? Have you seen any examples of this whilst on placement? 2)Read the following section ‘Vocational Rehabilitation Drivers and Related Government Initiatives’ and have a think about the questions listed at the bottom of page 18. Can you relate these to any aspect of physiotherapy practice you’ve seen? 3)Read the final section on ‘Working to Achieve the Potential of Vocational Rehabilitation’ and critically reflect on the changes that Physiotherapists can make to get the most out of Vocational Rehabilitation. This task requires you to look at Vocational Rehabilitation: What Works, For Whom and When by Waddell, Burton and Kendall. Click the image below to access it. What is the main objective of vocational rehabilitation? Reflect on ways you can achieve this objective in your physiotherapy practice. What are the four types of vocational rehabilitation interventions? What is the main difference between primary health care interventions and 'structured' vocational rehabilitation interventions? Have you come across any of these interventions or any others not mentioned in the document whilst on clinical placement? When is vocational rehabilitation most effective? Why is the concept of early intervention central to vocational rehabilitation? What two things are necessary in order to produce effective return to work and vocational rehabilitation? From the mentioned health problems which of them is lacking Vocational Rehabilitation interventions? Which of the mentioned health problems is the largest growing cause of long term incapacity? 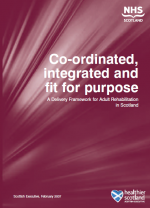 For this task, please look at Co-ordinated, integrated and fit for purpose - A Delivery Framework for Adult Rehabilitation which can be accessed by clicking the link below. 1)Read the foreword by Olivia Giles (pp 2-3). Critically reflect on this in relation to what you have already learned about vocational rehabilitation. Do you think anything else could be implemented to help people in similar situations to Olivia, looking to get back to what they did prior to illness? 2)Read section 3, paying particular attention to pages 14-16. What does this policy say about the definition of rehabilitation? Do you agree? What levels of management do you think are most appropriate within vocational rehabilitation? Why? 3)Read the section showing the future model for rehabilitation (pp 20-24). 4)Read pages 32-35 specific to vocational rehabilitation. Make notes on the key points you take from this. 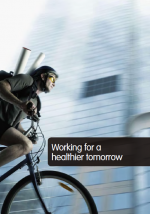 For this ask you should read Working for a Healthier Tomorrow by Dame Carol Black. You can access this document here. What are the effects of ill-health and worklessness on families and children? Why is the health of the working age population important for everyone? This review identifies a new vision for the health of the working age population. What is this new vision and what are the three principle objectives associated with it? What is the relationship between the workplace and an individuals health, safety and wellbeing? Why is an employees health of great concern to organizations? What strategies can be used to help support organizations in maintaining an employee's health, safety and wellbeing? Can you explain why early intervention for sickness absence is important? Reflect on incidences you have encountered on placement where early intervention would have been appropriate. What are the three key principles for effective early intervention? What is the 'fit for work' service and how does this service differ from the current service delivery. What are the challenges faced by occupational health? Can you suggest any strategies for overcoming these barriers? What is the future vision for the working age health and what are the four fundamental principles that underpin it? NICE Clinical Guideline 19 provides a guideline on workplace health in long-term sickness absence and incapacity to work. NICE recognized that employment enhances an individual’s health and wellbeing, conversely, it can also negatively impact on it with both employers and employees playing a part in an individual’s work absence. 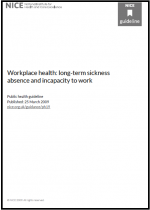 Hence this guideline was developed to help employers, employees, NHS professionals and other health professionals manage long term absence and incapacity. arrangement for referrals to appropriate specialists or services including occupational health adviser,another professional specialising in occupational health, health and safety, rehabilitation, ergonomics or a physiotherapist. To read more on all 4 recommendations for assessment and management click this image. 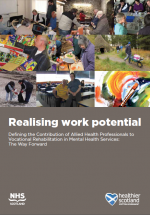 Realising Work Potential: Defining the Contribution of Allied Health Professionals to Vocational Rehabilitation in Mental Health Services: The Way Forward. You can access this document by clicking the image below. Engaging in work and productive occupation has a positive influence on an individual's mental well-being. Hence, keeping people in work is a priority for the Scottish government and in 2010 they released the document ‘Realising Potential - An Action Plan for Allied Health Professionals in Mental Health’ which established a direct link between mental health and rehabilitation policy frameworks to get people back to work. They also identified early intervention as being key to this recovery. This report is a follow up of Realising Potential and fulfils the pledge made by the Scottish government in realising potential to review current vocational rehabilitation models employed by Allied Healthcare Professionals in meeting the vocational needs of people with mental health problems and the provision of vocational rehabilitation across the 5 levels of healthcare. assessing patients for appropriate walking aid and providing exercise programmes to improve confidence in regards to mobility issues for patients wishing to engage in volunteer role. joint working with occupational therapist in a community rehabilitation unit to improve fitness and promote weight loss in order to increase work tolerance. telephone based advice for occupational therapist supporting patients with heart disease to develop appropriate exercise routine to return patient to vocational role. The report found that the best vocational rehabilitation model used by Allied Health Professionals is the Evidence Based Supported Employment and that the vocational rehabilitation service provision across the five levels of healthcare was mainly being provided in secondary and specialist mental health services. They suggested that Allied Healthcare Professionals should try reach those patients outside this level 3-4 spectrum to the ones that require earlier intervention. From the findings of the reviewed vocational rehabilitation models and service provisions, 6 key principles were identified to help guide the development of AHP vocational rehabilitation service provisions and action points to help achieve these principles. 1) The report provides examples of models of Vocational Rehabilitation that AHPs have developed or are working in partnership with. The examples are specific to Scotland and therefore provide examples of vocational rehabilitation models used by NHS board areas within Scotland. Read the full list of Vocational rehabilitation models used in Scotland on pages 23-24. Have you come across any of these before on placement? Do you know of any other models apart from these ones mentioned in the document? Are you aware of what models are used in the rest of the UK? 2) The report identified the majority of work carried out by AHPs in mental health services occurs in secondary and specialists services . 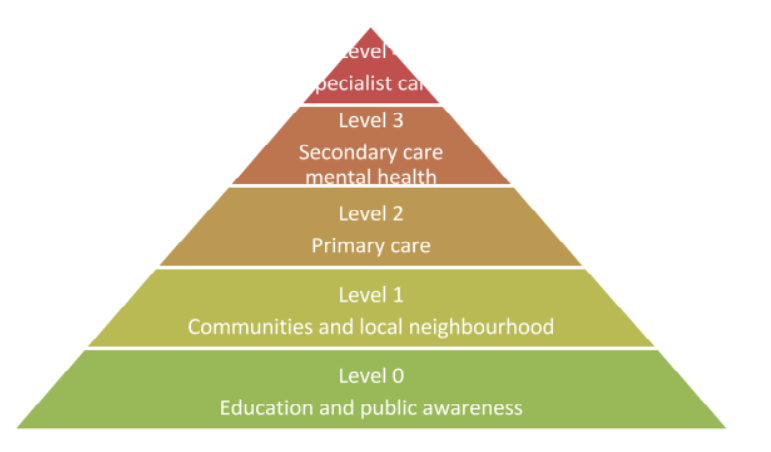 Through this identification they recommended that AHPs should consider trying to reach those patients outside this level 3-4 spectrum that require earlier intervention. with particular emphasises on the importance of enabling individuals to access services directly and easily before health issues become serious enough to require specialist, long-term care. Reflect on ways you might reach service users who require earlier intervention. 3) After reading the key principles and action plans found in the realising work potential document on pages 42-45, select two to four of these principles and reflect on how you would implement the proposed action plans into your clinical practice. NICE Clinical Guideline 22 provide a guideline on Mental Wellbeing at Work. You can access this guideline by clicking the image below. NICE recognized that work plays a vital part in promoting mental wellbeing but the work environment can also contain potential risks to an individual’s wellbeing. 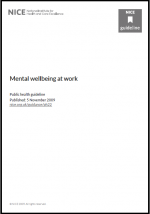 This guideline was designed for those who have a direct or indirect role in promoting mental wellbeing at work. Recommendations 1 -4 are intended to provide guidance specifically for employers, trade unions and other employee representatives. Whereas recommendation 5 has been specifically formulated to provide guidance for primary care trusts, primary care services and occupational health services hence the information provided in this recommendation is most appropriate and applicable for physiotherapists. However, it is not to say that recommendations 1-4 cannot be used by physiotherapists as the physiotherapists can still advise employers, trade unions and other employee representatives they come into contact with to refer to the advice provided recommendations 1-4.
collaborate with micro, small and medium-sized businesses and offer advice and a range of support and services including occupational health services. establish mechanisms for providing support and advice on developing and implementing organisation-wide approaches to promoting mental wellbeing. These could include tools and approaches for risk assessment, human resources management and management training and development. This is just one of the recommendations extracted from the guideline, to engage in more in-depth reading of the other recommendations please click the image above. Vocational rehabilitation enables patients with various health conditions to overcome barriers to accessing, sustaining or returning to employment or other meaningful occupation. Early intervention is key in vocational rehabilitation. The longer the patient is off work, the harder it becomes for them to return to work, making vocational rehabilitation more difficult. Vocational rehabilitation has tended to be a specialist focus in physiotherapy, but not everyone will see a specialist in the early stages of disease/injury. There is a gap between research and practice in vocational rehabilitation. Evidence based practice is widely used in healthcare settings, however it is a fairly new concept in vocational rehabilitation. Many vocational rehabilitation practitioners report that they face barriers such as inadequate time and limited access to technology and research. A large caseload size was also reported to affect the implementation of evidence based practice in vocational rehabilitation. lack of policy support and networks with other organisations to support a new initiative. 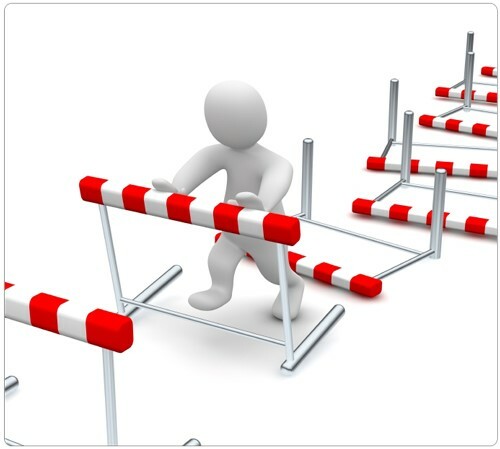 Other barriers lie with the healthcare professional themselves, including a lack of confidence, lack of knowledge, lack of desire for change and their own personal beliefs and the beliefs of others such as line managers. While healthcare has a key role in vocational rehabilitation, it is not a matter for health care alone. There is strong evidence to show that proactive company approaches are effective and cost effective. Vocational rehabilitation depends on work-focused healthcare and accommodating employers. Both are necessary to make a real and lasting difference. If employers are not accommodating to vocational rehabilitation it can cause a barrier to the healthcare professional providing effective vocational rehabilitation to the patient. It can be difficult to provide the best vocational rehabilitation if the employers are not working with the healthcare professionals to provide the patient with the optimum conditions to return to or stay at work, such as flexible working hours, phased return or modifying the patient's tasks until they can return to their full normal responsibilities and duties. Unemployment progressively damages health and results in more sickness, disability, mental illness, obesity and decreased life expectancy. Due to significant personal, attitudinal and structural barriers, people with mental health conditions are less likely to be engaged in work roles than those with other health conditions and 85% are unemployed. Another barrier could be the government support to returning to or remaining in work. Currently, most people with mental health problems are put in government run back-to-work schemes. MIND state that people with mental health problems should be offered a new vocational rehabilitation approach to returning to work that focuses on person-centred, specialist support that understands the patient and the challenges they face. They report that the current government schemes are actually making people more unwell and less likely to find work. They surveyed 439 people who were receiving support because of their mental health condition. 83% of the people surveyed reported that using back-to-work services through the Work Programme and/or Jobcentre Plus had made their mental health worse or much worse and lowered their self-esteem and confidence. 76% said that they felt less able to work as a result of being on these schemes. MIND are currently campaigning on this issue. Vocational rehabilitation working with healthcare professionals that have a comprehensive understanding of mental health and strategies to help people with mental health conditions to return to work would be more beneficial and avoid this barrier. In order to successfully implement vocational rehabilitation, the physiotherapist needs to consider environmental and social factors and understand the patient's perspective on returning to work. These factors can be factors that are outside the individual’s control, individual factors and employer-related factors. Factors that are outside the individual’s control include societal beliefs and attitudes, labour market, housing, transport, family and level of support, legal process, government policies and benefits. Individual factors include self-confidence, self-esteem, motivation, illness beliefs and attitudes, education, literacy, social skills, gender and co-morbidities. Employer-related factors are things such as sector, size, absence-management policies, culture and physical environment. There is a lack of statutory basis for ensuring the delivery of vocational rehabilitation services in the UK, which has contributed to a situation where service provision is not always based on the individual’s needs but on random matters such as the employment status of the individual, the type of benefit they receive, the priorities and resources of the NHS trusts, the circumstances of the injury, employer insurance cover and resources and also the position of the insurer towards funding VR. Vocational rehabilitation service providers must understand the motivation of the patient while also maintaining their responsibilities towards the patient, employer, employer’s customers and their own professional standards. The vocational rehabilitation service provider needs to recognise the patient’s perspective. Any fears they may have, such as future financial security or a fear of failure may, may be justified or subconsciously affecting their judgement. It is a good idea to keep a record of intervention and a barriers checklist is a good way of identifying issues and the steps taken to resolve them. 1. Why should I work in a job that is going nowhere and doing nothing except frustrate me and cause stress? 2. Why should I take a low paid job when I can get as much money in benefits? People with mental health conditions are especially sensitive to the negative effects of unemployment and the loss of structure, identity and purpose it provides. Work is important in maintaining and promoting mental health. It also reduces the need to use health services as it provides a social identity and status, social contacts and supports, a way of occupying and structuring time and a sense of achievement. A barrier flag system has been developed to enable health care professionals to identify potential barriers to returning to or remaining at work. As this wiki focuses on vocational rehabilitation, we will look further into blue flags. Blue flags are the workplace barriers to recovery. They are often accounted for by the psychosocial interactions between the employee and their workplace managers, supervisors and colleagues. Blue flags may be the most difficult flags for physiotherapists to address due to a lack of familiarity with the workplace the patient is in. As physiotherapists, our first principle must be to do no harm to the patient. Appropriate strategies should include commenting with caution. For example, a problem may be attributed to "workplace stress" but this is not a medical term and can imply all sorts of conditions. It is possible for physiotherapists to indirectly refer to workplace difficulties by suggesting workplace support, preparing the patient for returning to work by encouraging contact with their workplace and careful use of the term "light duties". In the workplace, there is often confusion about what this term means which can result in frustration as to what the patient can and cannot do. This needs to be stated clearly. Physiotherapists working in a vocational rehabilitation setting are in a better position to implement return to work strategies, have a better knowledge of how to communicate with employers and more experience in this field. However, this does not mean that physiotherapists in other settings should not approach the idea of vocational rehabilitation with the patient. A Physiotherapist working in the field of vocational rehabilitation expressed her opinion to us that the main difference between rehabilitation and vocational rehabilitation is than in vocational rehabilitation the physiotherapist has two patients, instead of one. One patient is the employee and the other is the employer. This could potentially cause an issue with confidentiality. The CSP Code of Conduct and the HCPC Standards of Proficiency state that Physiotherapists must maintain patient confidentiality. This means that to advise the employer about the employee’s ability to work, the physiotherapist must have the employees consent to do so. While the physiotherapist cannot divulge information about the employee’s condition, they can let the employer know what the employee is able to do with regards to their job role. The difficulty in this situation would be if the employee did not give consent for the physiotherapist to communicate with the employer. This would make providing vocational rehabilitation difficult as the physiotherapist would be unable to involve the employer in the rehabilitation process. Matilda is a 40-year-old care home assistant in a residential home for the elderly. She has been suffering from low back pain for over 6 months and has been prescribed anti-inflammatory medication and analgesia by her GP. She has not had any other intervention for her low back pain. Matilda is overweight and has diabetes. She reports that her low back pain refers to her buttocks and is made worse by bending forward. Her job is heavy - many of the residents require help with bodily functions and activities of daily living. Because of her low back pain, Matilda is feeling increasingly stressed as she is struggling to do her job and feels that her manager and co-workers are annoyed at her. Matilda feels that this is unsafe for her to do with her low back pain and asked her GP to sign her off work. She has been off work for 3 weeks and is receiving statutory sick pay. You are seeing Matilda as part of a vocational rehabilitation team to help her return to work. 1) Using your previous learning from university or experience on placement/at work, what would you look for if you were assessing Matilda for red flags? 2) What barriers do you think Matilda could be facing to return to work? 3) Using your knowledge of pain and stress, and any experience you may have, analyse on how you would approach Matilda and help her remain at or return to work. 4) Think about the barriers facing physiotherapists in vocational rehabilitation and construct ways to overcome these barriers. With most conditions there is a relationship between the severity of the injury or impairment and related barriers to employment. For people with physical injuries, impairments or disabilities environmental barriers to employment can be an issue, such as access to public or private transport and buildings. People with progressive conditions can face increasing problems in participating in the physical aspects of their work. Social factors affect those with mental health problems and physical disabilities. management belief that the worker should be 100% fit before returning to work. fear of ability to cope with the pre-injury/accident/illness job. Vocational rehabilitation users without employment may face the additional issues of restricted labour market opportunities, redundant skills, a lack of a financial incentive, age and disability discrimination, lack of references and transport. Almost 50% of long-term absences from work are the result of mental health issues. There are many potential barriers for people suffering with stress may face when remaining at or returning to work. 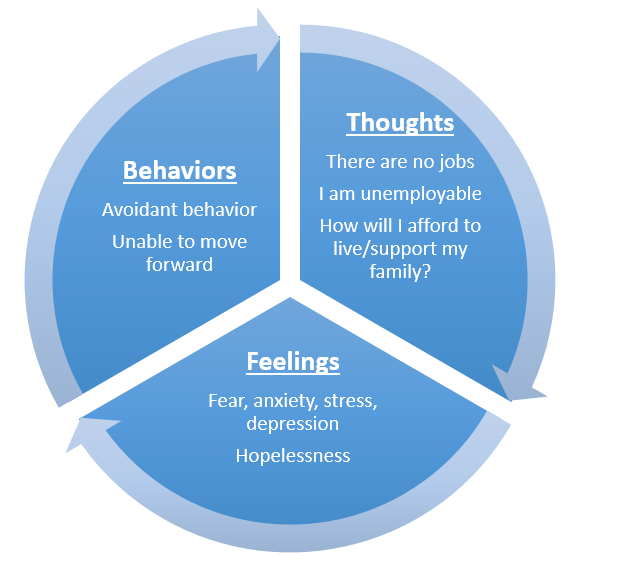 These barriers include a fear that colleagues may find out about the diagnosis and have possible negative reactions, a loss of connection with co-workers, a perceived or actual lack of support from employers and managers, uncertainty about the level or type of support available, the stigma associated with mental health conditions and concerns that work-related contributors to stress have not been addressed. Common concerns include facing discrimination or bullying and returning to work too soon and feeling unwell again. Some people fear returning to work because that is the place where their mental health conditions started, for various reasons such as unsupportive or bullying management or team members. Heads Up suggested some practical strategies to address these barriers, such as educating and providing mental health awareness training for managers and staff. Below is a See Me Scotland video about mental health in the workplace. While work can cause stress for some people in some situations, research shows that work is beneficial to health and well-being, not being in work is detrimental to health and well-being and re-employment after a time period of being unemployed leads to an improvement in health and well-being. Being employed can give the patient a greater sense of identity, an opportunity to meet new people and build new relationships, improve their financial situation and security and help them feel like they are playing an active part in society. Methods/equipment that can be used to replicate the workplace and the patients responsibilites. There can be communication barriers when working with people suffering from stress. The patient’s communication style may change when they are suffering from stress. They may struggle to find the ‘right’ word or they may swear more than usual. They may also become impatient and intolerant which can cause communication difficulties. Stress can cause sleeping problems, difficulty concentrating, low self-esteem, headaches, muscle tension or pain, all of which can be a barrier to physiotherapy and affect the effectiveness of physiotherapy treatment for different conditions. Consider the tools you have as a final year physiotherapy student or a newly graduated physiotherapist. What tools do you have at your disposal that would enable you to communicate effectively with a patient who was suffering from stress? Using Rolfe's model of reflection, reflect on an experience with a patient who was currently signed off work due to their presenting complaint or stress. Consider any communication barriers you may have faced and how/if you approached their thoughts on returning to work. How could you have improved upon this? Having outlined a brief overview of what vocational rehabilitation provides, we will now introduce more specific details about how the service is run, with special focus from a physiotherapist's role and in particular, how the topic of stress management is important. Ensuring there is a case manager who can be central to the treatment programme and can liaise with all MDT staff should allow for better within-health care communication and extending into the workplace. There is strong evidence to suggest that communication between professions is essential in creating an effective vocational rehabilitation programme as there is not one single profession that can deliver the service effectively. There is strong evidence to suggest that communication during this process needs to be improved. Focusing on a rehabilitation approach which gradually returns the patient to activities and work in a planned and structured way is advised. This means of treatment, allows for potentially necessary progressive physical healing to occur as well as preparing the patient to mentally return to work. This section will now look more specifically into the role that the physiotherapist plays in the returning to work of patients through vocational rehabilitation. We must be careful to outline that there is caution when stating ‘treating though vocational rehabilitation’, as vocational rehabilitation is more thought of as a connection linked to curing the initial issue, which has led to a person requiring occupation related assistance. Physiotherapists play an important role in the rehabilitation of these patients. As reported by the Chartered Society of Physiotherapy their aims are to get patients back to their best possible level of function and wellbeing including matching, and increasing their normal activities of daily living which may include activities in the home, for leisure or for work. For musculoskeletal conditions it is recommended that physiotherapists should have an active role in workplace interventions, these interventions should promote health and wellbeing within the workplace in order to encourage normal function. Patients suffering from stroke account for just 0.7% of patient cases seen for vocational rehabilitation rehabilitation, however there are currently 27,500 people each year in England who are of working age, who suffer from strokes. This complex and individualised neurological condition results in many difficult factors which affect a patient’s ability to return to work. Primarily, mobility issues, cognitive impairment and reduced hand function. Currently the provision for vocational rehabilitation services within this population is low with lack of suitable and appropriately timed care pathways, training to practitioners and integrated health-employer partnerships. Early intervention has been noted as vital and should be coupled with continual support throughout the whole rehabilitation process. Research has been undertaken in relation to the effect of vocational rehabilitation in terms of dealing with patients after an acquired brain injury. A study in 2015 highlighted how only 40% of people are able to return to paid work within 2 years. It emphasised the importance of a specific protocol called Early Vocational Rehabilitation (Evocational Rehabilitation) which is designed to guide an effective multidisciplinary approach of vocational rehabilitation. The final condition which we will look into, has been regarded as having the highest prevalence within vocational rehabilitation - mental health. At 35%, which includes patients with stress, depression and anxiety, it is a large proportion of the population. This cannot be said for more serious mental health illnesses such as schizophrenia or cognitive impairments, which have less population size. 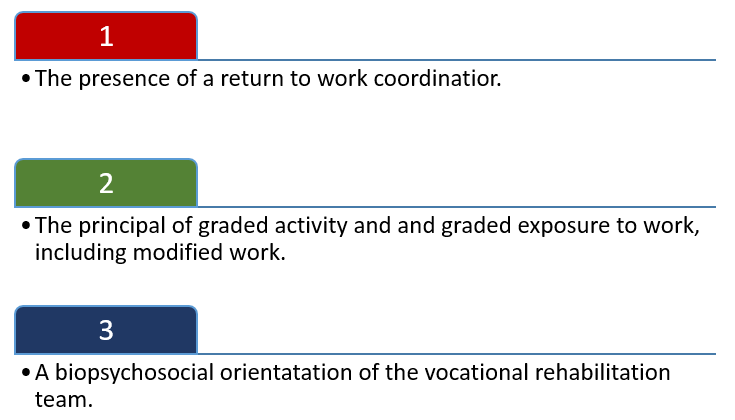 In order to effectively meet the third principle of vocation rehabilitation, we will look towards the International Classification of Functioning, Disability and Health (ICF) (Figure 7). This is a biopsychosocial framework which outlines links between how a health problem can impact the different elements of people's lives. Physiotherapists must be aware of this and incorporate it, to provide a holistic approach to vocational rehabilitation planning. As with all rehabilitation approaches, practitioners must ensure that the patient's needs are of utmost importance and in order to do this, physiotherapists are increasingly aiding in the recovery of patients who suffer from psychological conditions. In order to effectively do this, they should provide advice and treatment based not only just on physiological problems but also psychological symptoms. This is implemented through different guidelines due to the high frequency and significance of mental factors affecting patients. The NHS Knowledge and Skills Framework (KSF) acknowledge this importance through Outlines HWB6 and HWB7: “psychological factors throughout assessment, treatment planning and implementation”. A physiotherapist role in the recovery and rehabilitation of patients suffering from a mental illness should merge the treatment of psychological and physical conditions into one; we now look specifically into consolidating the management of the mental condition, stress and how physiotherapy can help deal with this through the vocational rehabilitation setting. As previously described we know that musculoskeletal problems are the second highest (22%) reason why patients require vocational rehabilitation, this coming only behind patients who have been out of work due to stress related conditions (35%). Commonly, it is through treatment of musculoskeletal problems that will determine if the stress can be reduced.Research highly documents that a high proportion of patients with MSK conditions develop a mental health condition. From critiquing these articles, this knowledge justifies how important physiotherapists can be in reducing work related absence. This is represented in Figure 8. We now understand that physiotherapists within vocational rehabilitation can treat patients who are out of work due to a multitude of ailments whether that be physical, mental or psychosocial. However further understanding behind stress in the working population is needed before the topics of physiotherapy treatment and intervention in the management of stress can be discussed. For this learning activity we would advise you to recap your knowledge of the flag system from your basic subjective. We are getting you to reflect back to your learning of this subject and apply this knowledge, combined with the literature surrounding vocational rehabilitation to complete the task on the case study. Margaret, a 42 year old woman has come into your MSK practice with recurrent pains in her lower back. She complains that the pain is a constant 10/10 pain while she is at work and that it is relieved when she is sitting down, in the bath or not at work. Margaret has been off work for the past 3 weeks and has been referred through work to your practice. Margaret is reluctant to return to work as she fears that the pain will return. As a physiotherapist/ 4th year physiotherapist. Chose one of the following flags and justify why the patient could be considered at risk of these..
Red flags- General associated with serious pathologies, cauda equina, tumours, fractures ect. Yellow flags- Generally associated with thoughts towards pain, anxiety, depression, fear. Blue Flags- Generally associated with work, beliefs surrounding work and work related stress. What is Stress in the Work Place? As noted in section six stress, is becoming a worldwide issue and it is important to acknowledge the effects of stress on individuals in and out of the workplace. It is suggested that a considerable percentage of people out of work will develop a mental disorder due to the stress of unemployment. Likewise, patients can equally develop a mental disorder and be subject to mental distress within the workplace. As a physiotherapist whose treatment largely involves physiological techniques, what treatments have you done or would you use or adapt to use with people who are suffering from stress? There is significant evidence to show benefits of exercise for the treatment of stress within the workplace. Due to this increased awareness there has been recent increases in the application of prescribed exercise. A systematic review highlights the benefits of exercise on improving the symptoms of those suffering from depression such as increased self-efficacy self-worth and self-image. It is known that on a physiological level, exercise increases the amount of endorphins within the body. These hormones are well associated with happiness and contribute to the feeling of wellbeing and comfort. A rise in the level of endorphins within the body creates a feeling of joy, improves a normal appetite and boosts the immune system. This response to endorphins helps reduce the negative effect of stress on the body. With the increase of prescribed exercise there is also an increased awareness of stress affecting employees in the workplace. Therefore there is an emphasis on creating effective work based exercise programmes aimed at helping people suffering from stress to manage their symptoms more effectively. With stress management there are key stages that need to be implemented to ensure effective treatment. The initial stage should be highly focused on the education of the individual it is suggested that a heavily structured programme is created and agreed between the employer and the employee. There is limited evidence to suggest a precise physiotherapy management for patients suffering from stress. Although there is an increase in stress cases, the amount of evidence has not increased proportionally. Anxiety and stress were found to be the most common symptoms, alongside anger, depression and low mood to affect patients mental wellbeing. It is important that clinicians recognise warning signs of these conditions as it has been noted that patients who have a psychological complication are more at risk of developing further problems such as increased muscular tension, development of trigger points and reduced function. After research, within clinical practice there have been many different interventions used by physiotherapists to overcome these mental barriers. Some of these include; relaxation, imagery, cognitive behavioural therapy, neurological programming and 'mindfulness based stress reduction'. However, the 4 which have been more widely used in clinical practice are: goal setting, positive self talk, effective communication, as well as including variation to rehabilitation exercises. The theory behind implementing patient and physiotherapist led goals during a rehabilitation session, is that it gives both physiotherapist and patient a common target that both feel they can work towards in order for improvement to be seen. Reviews which looked at patients thoughts and interpretation of the effectiveness of goal setting explained that they felt it improved their self-confidence, self-esteem and self-efficacy. These positive experiences felt by patients are significant as it has been concluded that patient participation is of extreme importance for when the suitable time is made for goals to be put in place. Apart from increasing the interest and participation of patient's, goal setting also provides the benefit of empowering the patient to take their own responsibility for their recovery as well as aiming to make the rehabilitation process more meaningful and patient centred. However, even though reports from patients have shown largely positive insight into goal setting, when researching physiotherapists views on the subject, a different view point is made aware by Schoeb. It has been found that although goal setting is used widely throughout physiotherapy practices and for many varied patients, there is reason to believe that approaches used for goal setting are rarely standardised. Due to this, it can therefore mean that the effectiveness of approaches used for goal setting can also be inconsistent. Because of this, there is an increased need for training of professionals within this area. This requirement has been recognised and agreed by some physiotherapists as being an intervention in which they would like to learn further skills in order to implement realistic goal setting for their patients. When looking towards vocational rehabilitation for the management of patients suffering with stress it is important as physiotherapists recognise the importance of an effective relationship between patient and practitioner. From a qualitative review of therapists, certain characteristics and qualities were deemed the most effective in creating a positive alliance between patient and therapist throughout the process of vocational rehabilitation. It was shown that the main characteristics to creating a positive patient therapist relationship were as follows; being trustworthy, experienced in their field; flexible, respectful, confident, warm and open. It is suggested that these qualities will enable a patient to have a more supportive beneficial relationship with the clinician which should allow for greater prospects for change. Therefore while practicing, it is essential to be aware of these traits as applying this knowledge may benefit the relationship that you are able to build with your patient and may have a positive experience on their treatment. 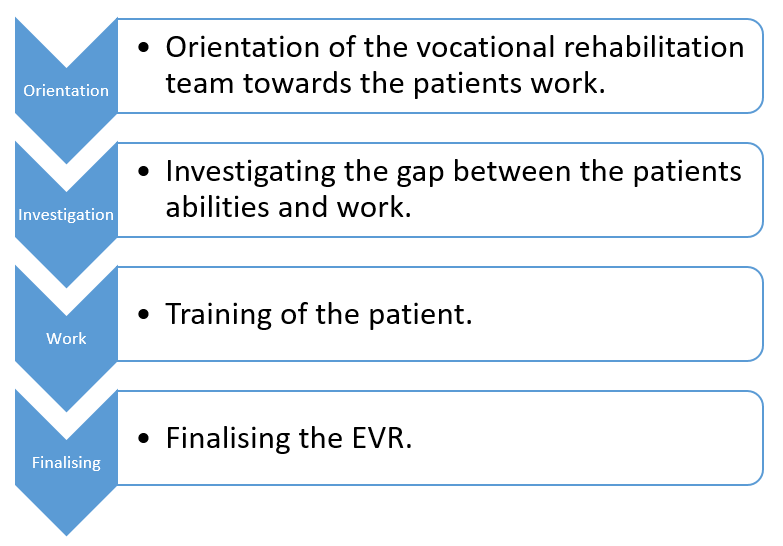 The stage at which physiotherapists enter into vocational rehabilitation can be seen in Figure 9. It must be noted that the point of entry does not and should not end here, ideally continuing to progress until an ultimate goal has been reached. The CSP suggests that for physiotherapy interventions for work based sickness to be effective it has to be easily accessible and started promptly after the initial onset of illness. By playing a role in vocational rehabilitation at such an early stage, it is important that those patients in need are seen early by a physiotherapist. To help with this, vocational rehabilitation physiotherapists can be in a range of settings from routine health care, to private and public workplaces, allowing for larger access to many various people. As healthcare professionals physiotherapists also experience stress. From a study looking at 3 general hospitals it identifies the main causes of occupational stress. This study uses ‘The Occupational Stressors Inventory Questionnaire’ as a way to evaluate the participants perceived stress levels. This is a 23 point, self-rated questionnaire. It was used on 55 physiotherapists in Lisborn to establish their main occupational stresses. Over half the participants deemed themselves to be moderately stressed within the workplace. From the study, it was established that the main causes of stress were lack of order in the hierarchy command chain, disorganisation in work distribution, overload and low salary. For continued up to date information on the principle of vocational rehabilitation, we encourage our readers to subscribe to the Journal of Vocational Rehabilitation. From consolidating the research you should understand how physiotherapists within a MDT team can make a difference to patients within a vocational rehabilitation setting. Treatment of those suffering from stress, was found to be mostly through indirect rehabilitation of a co-exsisting injury. Unfortunately there are considerable gaps in the literature specific to physiotherapists treatment of stress and mental illness independently of a physiological condition. However, you should now understand how physiotherapists can still help to reduce the effects of stress their patients have, and therefore enable them to stay at, return to or start work in varying environments. This holistic approach is something which can be implemented widely across all physiotherapy fields and hopefully now through learning how and why tackling patients stress is important, will encourage you to approach the topic within clinical practice. What methods of communication are you aware of /experienced and what ways could you implement good communication within your practice. Take time to compare and contrast your ideas and justify your top 3 choices. Stress is defined as a response to being put under pressure or situations that put an individual under pressure that if left unaddressed can result in psychological, physiological and behavioural changes to an individual. There is a strong link between stress and sickness absence. Unemployment can have detrimental effects on both the individual and economy. There is a common view that mental health problems and stress are caused by work however the relationship between the two is complex. While mental well-being can be affected adversely by work there is also strong evidence that work is good for both mental and physical health which are at risk of being reduced or removed once an individual is out of work. From the evidence it can be concluded that work can be therapeutic in that it can transpose the negative health effects of being out of work. Hence through work targeted interventions like vocational rehabilitation and physiotherapy individuals with health problems are helped to return to work. Vocational rehabilitation is the idea of helping people with health problems stay at, return to and remain in work. It adopts a multidisciplinary approach, involving both healthcare professionals and employers and can also be practiced in a variety of settings from primary healthcare settings to the workplace. There is significant evidence to suggest that the longer a person is absent from work due to ill health, the harder it is for them to make an effective return. Hence, a graded return to work plan can often be adopted by effective negotiation and communication between employers, employees and healthcare professionals. However, both vocational rehabilitation practitioners and healthcare professionals have reported barriers such as, limited access to technology, lack of knowledge, issues with confidentiality and lack of collaboration with employers. Despite vocational rehabilitation being seen as a specialist role in physiotherapy this does not mean that physiotherapists in other settings should not approach the idea of vocational rehabilitation. The physiotherapists role in the recovery of patients suffering from a mental illness, such as stress, should merge the treatment of psychological and physical conditions into one. From the exploration of this topic it can be concluded that further research is required due to the lack evidence linking stress and physiotherapy in vocational rehabilitation. Synthesise the main principles of vocational rehabilitation and critically analyse its role in achieving an optimum vocational outcome. As you did in the first task, construct another mind map of what you have learnt through this wiki on vocational rehabilitation and on stress. Contrast and compare these two mind maps. Critically evaluate how you could use this new knowledge in your current practice. ↑ Adams NE. Bloom's taxonomy of cognitive learning objectives. Journal of the Medical Library Association 2015; 103:3:152-153. ↑ Gardner D, Fletcher R. Positive and negative affective outcomes of occupational stress. New Zealand Journal of Psychology 2006; 35; 2; 92-98. ↑ 8.0 8.1 8.2 Salleh MR. Life Event, Stress and Illness. Malaysian Journal of Medical Science 2008; 15; 4; 9–18. ↑ Habibi E, Dehghan H, Safari S, Mahaki B, Hassanzadeh A. 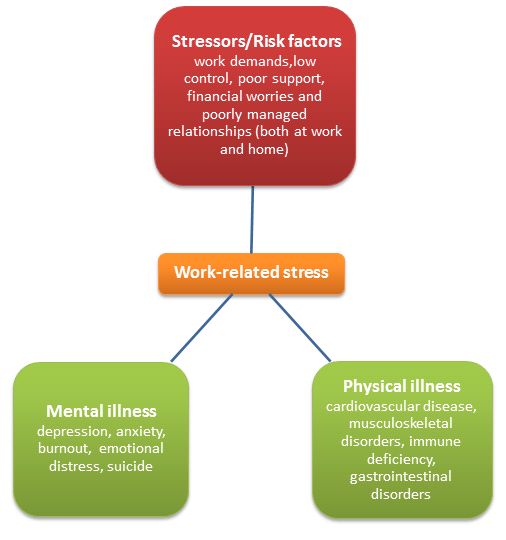 Effects of work-related stress on work ability index among refinery workers. Journal of Education and Health Promotion 2014; 3:18:1-11. ↑ Torpy JM, Burke AE, Glass RM. Acute Emotional Stress and the Heart. Journal of the American Medical Association 2007; 298:3. ↑ Lundberg U, Forsman M, Zachau G, Eklöf M, Palmerud G, Melin B, Kadefors R. Effects of experimentally induced mental and physical stress on trapezius motor unit recruitment. Work & Stress 2002; 16:2:166-178. ↑ 17.0 17.1 Ongori H, Agolla, JE. Occupational Stress in Organizations and Its Effects on Organizational Performance. Journal of Management Research 2008; 8:3:123-135. ↑ Negeliskii C, Lautert L. Occupational Stress and Work Capacity of Nurses of a Hospital Group. Original Article 2011; 19:3:606-613. ↑ Ekundayo JA. Occupational Stress and Employees Productivity in the Workplace.fckLRInternational Journal of Scientific Research in Education 2014; 7:2:157-165. ↑ Park J. Work stress and job performance. Perspectives on Labour and Income. ↑ Hauke A, Flintrop J, Brun E, Rugulies R. The impact of work-related psychosocial stressors on the onset of musculoskeletal disorders in specific body regions: A review and metaanalysis of 54 longitudinal studies. Work & Stress 2011; 25:3:243-256. ↑ Department for Work and Pensions. 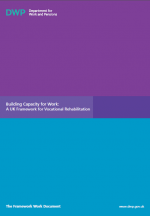 Building Capacity for Work: A UK framework for Vocational Rehabilitation. ↑ 35.00 35.01 35.02 35.03 35.04 35.05 35.06 35.07 35.08 35.09 35.10 35.11 35.12 35.13 35.14 35.15 35.16 35.17 Langman C. Introduction to Vocational Rehabilitation: Policies, Practices and Skills. New York: Routledge, 2012. ↑ Lui J, Anderson CA, Matthews P, Nierenhausen E, Schlegelmilch A. Knowledge translation strategies to improve the resources for rehabilitation counsellors to employ best practices in the delivery of vocational rehabilitation services. Journal of Vocational Rehabilitation 2014; 41:167-145. ↑ 45.0 45.1 Gobelet C, Luth F, Al-Khodairy AT and Chamberlain MA. 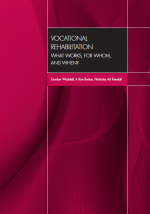 Vocational Rehabilitation: A Multidisciplinary Intervention.Disability and Rehabilitation Journal 2009;29:1405-10. http://www.tandfonline.com/doi/full/10.1080/09638280701315060 (accessed 29 Dec 2015). ↑ Kutash K, Acri M, Pollock M, Armusewicz K, Olin SS, Hoagwood KE. Quality Indicators for Multidisciplinary Team Functioning in Community-Based Children’s Mental Health Services. Administration and Policy in Mental Health and Mental Health Services Research 2014;41:1: 55-58. http://link.springer.com/article/10.1007/s10488-013-0508-2#/page-2 (accessed 29 Dec 2015). ↑ MacEachen E, Clarke J, Franche RL, Irvin E. Systematic review of the qualitative literature on return to work after injury. Scand J Work Environ Health 2006 32: 257-269. ↑ Beaumont DG. Rehabilitation and retention in the workplace - the interaction between general Practitioners and occupational health professionals: a consensus statement. Occupational Medicine 2003; 53: 254-255. ↑ Beaumont DG. The interaction between general practitioners and occupational health Professionals in relation to rehabilitation for work: a Delphi study. Occupational Medicine53: 249-253. ↑ Shaw W, Hong Q, Pransky G, Loisel P. A literature review describing the role of return-to-work coordination trial programs and interventions designed to prevent workplace disability. J Occupational Rehabilitation 2008; 18: 2-15. ↑ 54.0 54.1 Sinclair E, Radford K, Grant M, Terry J. Developing stroke-specific vocational rehabilitation: a soft systems analysis of current service provision. Disability and Rehabilitation 2014;36:5:409-417. http://dx.doi.org/10.3109/09638288.2013.793410 (assessed 1 Jan 2016). ↑ Velzen van JM, Van Bennekom CAM, Sluiter JK, Frings-Dresen MHW. Early vocational rehabilitation after acquired brain injury: a structured and interdisciplinary approach. Journal of Vocational Rehabilitation 2015;42:31-40. http://www.researchgate.net/publication/275257435 (assecessed 1 Jan 2016). ↑ Dean D, Pepper J, Schmidt R, Stern S. The effects of vocational rehabilitation for people with cognitive impairments. International Economic Review 2015;56:2:399-426. http://onlinelibrary.wiley.com/doi/10.1111/iere.12109/abstract;jsessionid=0426BF7CD3467357E9036E00CEB98C92.f03t03?userIsAuthenticated=false&deniedAccessCustomisedMessage=(accessed 2 Jan 2016). ↑ WHO. International Classification of Functioning, Disability and Health (ICF) framework to facilitate Interprofessional education and collaborative practice. http://www.who.int/hrh/news/2014/hrh_icf_framework/en/ (accessed 29 Dec 2016). ↑ Sept Local Services, Local solutions. NHS Core Values. http://www.sept.nhs.uk/about-us/nhs-constitution/nhs-core-values/ (accessed 2 Jan 2016). ↑ NHS Employers. Simplified KSF. http://www.nhsemployers.org/SimplifiedKSF (accessed 28 January 2016). ↑ Simpson GW, Byrne P, Gabbay MB, Rannard A. Understanding illnedd experiences of employees with common mental health disorders. Occupation Medicine 2015;66:1:80. http://occmed.oxfordjournals.org/content/early/2015/05/07/occmed.kqv047. (accessed 3 Jan 2016). ↑ Crofford LJ. Psychological aspects of chronic musculoskeletal pain. Best Practice and Research Clinical Rheumatology 2015;29:1:147-55. http://www.sciencedirect.com/science/article/pii/S1521694215000340 (accessed 3 Jan 2016). ↑ Bonzini M, Bertu L, Veronesi G, Conti M, Coggon D, Ferrario MM. Is musculoskeletal pain a consequence or a cause of occupational stress? A longitudinal study. International Archives of Occupational and Environmental Health 2014;88:5:607-12. http://link.springer.com/article/10.1007/s00420-014-0982-1#/page-2 (accessed 3 Jan 2016). ↑ Audhoe SS, Hoving JL, Sluiter JK, Frings-Dresen MHW. Vocational Interventions for Unemployed: Effects on Work Participation and Mental Distress. A Systematic Review. Spinger Sciences 2009;20:1-13. ↑ Lawlor DA, Hopker SW. The Effectiveness of Exercise as an intervention in the management of depression: A systematic review and meta-regression analysis of Random Control Trials. BJM 2001; 322: 763-7. ↑ Stress Management Society: Taking Companies and Individuals from stress to de-stress. How it affects us. http://www.stress.org.uk/How-it-effects-us.aspx (5 Jan 2016). ↑ Long BC, Flood KR, Taylor and Francis Group. 1993;2:109-119. ↑ Meichenbaum D. Stress Inoculation Training . 1985. Pergamon. ↑ 68.0 68.1 68.2 Alexanders J, Anderson A, Henderson S. Musculoskeletal physiotherapists’ use of psychological intervention: a systematic review of therapist’ perceptions and practice. Physiotherapy 2015;101:95-102. http://www.sciencedirect.com/science/article/pii/S0031940614001102 (accessed 5 Jan 2016). ↑ Mirza SK, Deyo RA, Heagerty PJ, Turner JA, Martin BI, Comstock BA. One-year outcomes of surgical versus nonsurgical treatments for discogenic back pain: a community-based prospective cohort study. Spine J 2013;13(11):1421–33. ↑ Brunner E, De Hart A, Minguet P, Baldew S, Probst M. Can cognitive behavioural therapy based strategies be integrated into physiotherapy for the prevention of chronic low back pain? A systematic review. Disabil Rehabil 2013;35(1):1–10. ↑ Karunaratne M. Neuro-linguistic programming and application in treatment of phobias. Complement Ther Clin Pract 2010;16(4):203–7. ↑ Dufour S, Graham S, Friesen J, Rosenblat M, Rous C, Richardson J. Physiotherapists supporting self-management through health coaching: a mixed methods program evaluation. Physiotherapy Theory Practice 2014;1:1–10. ↑ Lemieux-Charles L, Mcguire WL. What Do We Know about Health Care Team Effectiveness? A Review of the Literature. Sage Journals 2014 2006: 63: 3 2063-300. ↑ Schoeb V. ‘The goal is to be more flexible’ – Detailed Analysis of Goal Setting in Physiotherapy using a conventional analytic approach. Manual Therapy 2009; 14: 665-670. ↑ 75.0 75.1 Ackerman S, Hilsenroth MJ. A review of therapist characteristics and techniques positively impacting the therapeutic alliance. Clinical Psychology 2003;23: 1-33.